Multi-purpose digital valve controller for the operation of all valve types including air operated, spray and motor driven auger types. The TS500R is a universal valve controller for all metering valves including pinch, diaphragm, needle, spool piston, spray and auger. It can run at up to 900 cycles per minute, it has an LCD display, memory storage, 0.008 to 60 second timer, +/- 0.001% repeat tolerance, low pressure alarm feature, universal voltage, I/O connector. The display is a clear 20 x 4 segment LCD and shows time and pressure settings in both PSI and BAR. Up to 10 individual program settings can be stored. The TS500R features an adjustable low pressure alarm for higher levels of control. With a universal power supply, it is a fully plug and play system and can be used immediately, anywhere in the world, with its accompanying tools and accessories. 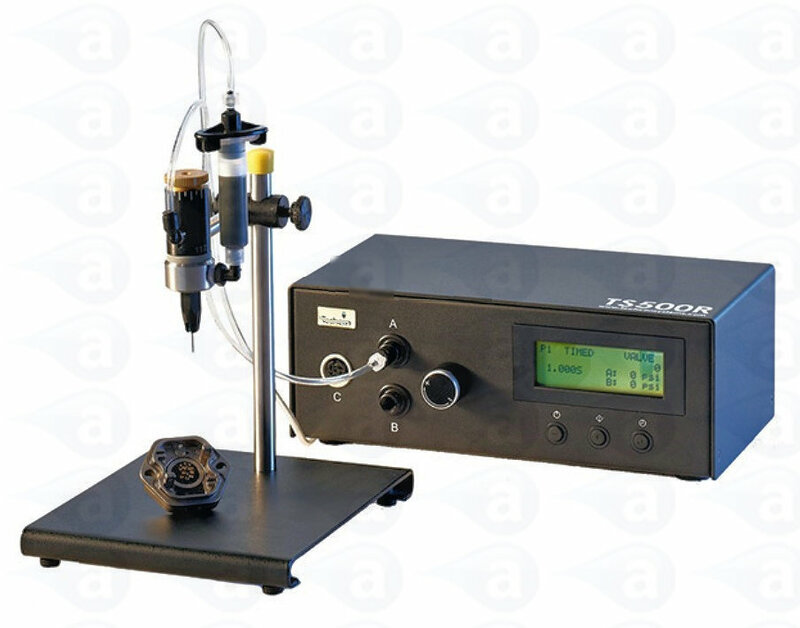 This system uses a highly responsive air pressure management system, coupled with a digital timing circuit and display, to provide consistent, repeatable control over all types of valves. All products are industrial grade and are covered by our no-quibble One Year warranty. 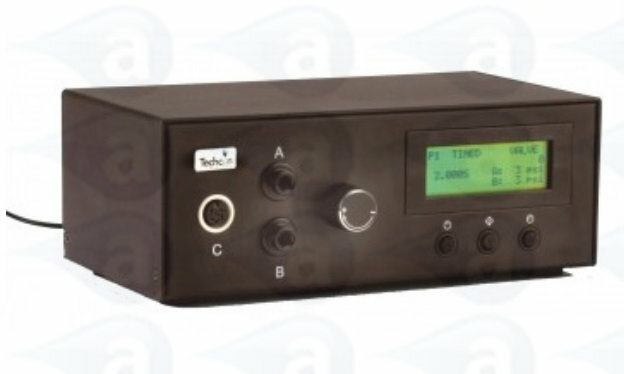 Summary: Universal digital valve controller with foot pedal control or remote I/O connection. Make rapid dots or beads using the timer. Memory storage function. Low pressure alarm. Works with all dispensing valves. Controllers require clean and dry compressed air from most small compressors, a mains factory air supply or nitrogen. We recommend a 5 micron air filter on the supply air into the dispenser. This will reduce oil, moisture and particles from the air. Controllers will handle all valve types including air operated pinch tube, diaphragm, needle and spray as well as motor driven auger valves. Dispensing valves compatible with this controller unit.